Audials can record Netflix, Amazon, Hulu, YouTube, CNN, Fox News and many other online streams. Audials Moviebox has been pre-configured with the perfect recording method for dozens of services, offering its users the very best quality. Audials can automatically keep recording movies and series (episode after episode) non-stop. This way you can go to bed and have Audials record you an entire season overnight. Thanks to its pre-configured recording methods for popular video streaming services, Moviebox is light years ahead of other tools. Moviebox is also ideal for all kinds of other services: It can directly record from the graphics card as a way of achieving perfect quality, and its screen recording function means it can be used in all situations. Audials is the only software that is compatible with adaptive streaming and current HTML5-based DRM mechanisms such as EME. This means you will always receive all your recordings in HD and saved as an MP4, HVEC, H.264 or WMV. 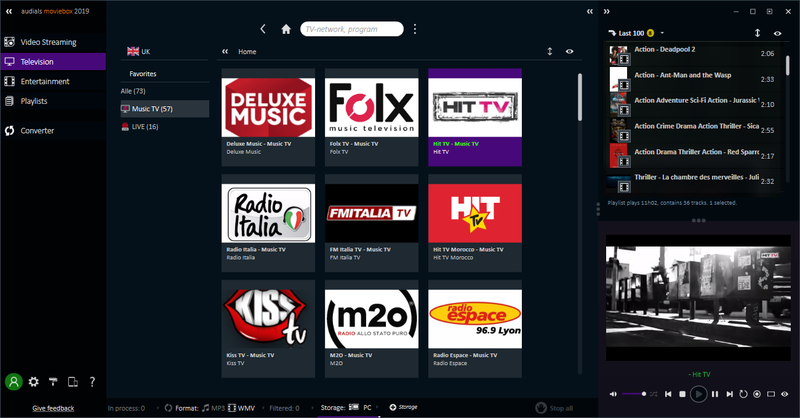 Audials features 100 English and international live TV streams and dozens of the best music TV channels. Audials Moviebox enables you to record all the content you want from media libraries and live TV streams. At the touch of a button, you can easily record any live event in the highest quality. 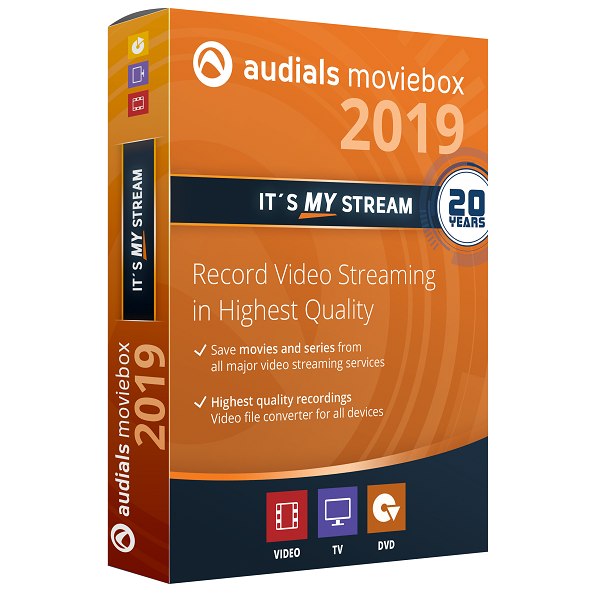 Not only does Audials provide you with perfectly recorded movies and series, it also automatically names your recordings: Just what you would expect of a proper video store. The software even comes with a search engine that allows you to find short movie descriptions, the actors, directors, and genres, etc.! Enjoy top entertainment with the Audials Player for movies, series, live TV and video clips. Audials is constantly working in the background to make sure that your streaming recorder always works. Our specialists work week-in, week-out to ensure that everything is always fully functioning. You can manage your media on your PC and in the cloud, but you can also easily transfer it to mobile devices. Only with Audials: Record and Archive All Episodes and Seasons of your Favorite TV Show from Amazon Video and Netflix Automatically! You play the desired movie briefly in the browser. Audials is grabbing the link to the stream and adds the film to the recording planner! If you have collected all the movies Audials starts the recording process. Netflix, Amazon and other popular online video libraries encrypt their video streams. The majority of tools cannot record such encrypted video streams. 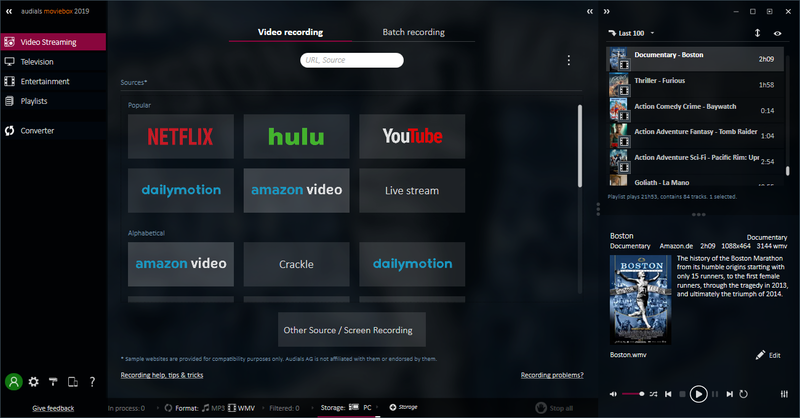 However, with Audials Moviebox you can record any type of video stream directly as you play it. Without any loss of quality and in its original size, Audials records both open and protected videos and films from any source and saves them as a legal private copy. If purchased films and videos cannot be played back due to DRM copy protection or their file format, Audials Moviebox helps you and frees you from any problem: Using legal recording with the PerfectVideo quality guarantee, Audials Moviebox solves all copy protection problems, saves all films as new unprotected MP4, WMV or H.264 files, for example, and so ensures unrestricted enjoyment on all devices. Using different software tools it is possible to create MKV files of Blue-ray films. However, not all devices can play the MKV video format. Audials Tunebite provides a solution here and converts films from Blu-ray films from the available MKV video format to new files in MP4, WMV, AVI or other video formats both reliably and without loss of quality. Audials Moviebox helps you build your own video library. 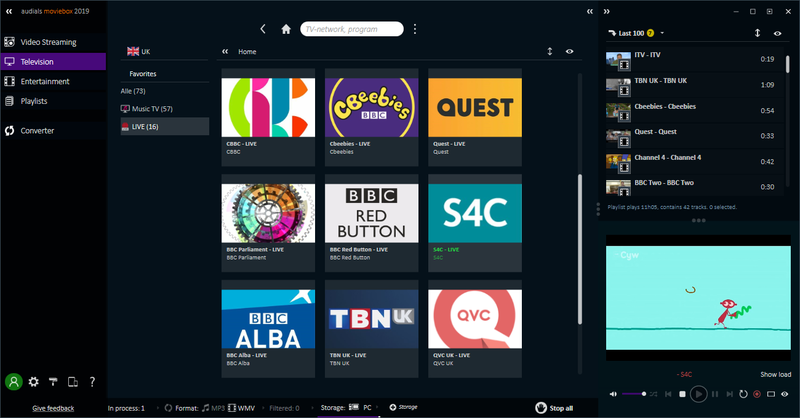 A media manager for PC, Clouds, to fill up your smartphone or tablet as well as a comfortable media player with many extras are therefore also included. Your movies are automatically structured according to category. Tagged movies are automatically sorted into a folder with the corresponding movie genre. This means that with each new movie added, your own personal video library is expanded. You can also manually add folders for your favorite actors, directors or if a movie has more than one part, put all the parts together in a special separate folder. Instead of seeing only a file name or movie title, you can now browse through your video collection by movie cover image to select and play the video you want.